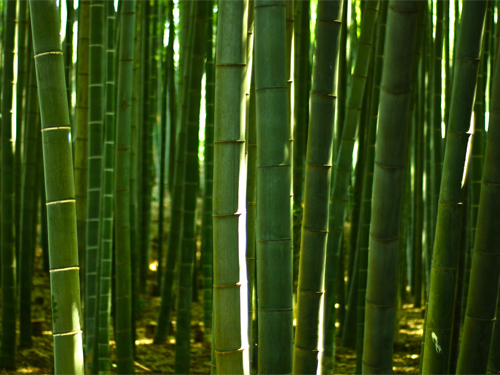 Kairakuen is a park located in the city of Mito, in the prefecture of Ibaraki. The first thought that might enter your head upon reading that is: 'Kairakuen? Mito? Ibaraki? What are these places of which you speak?' Even in Japan, most people would be hard pressed to locate Ibaraki on a map, or know anything about it. It's both too far from Tokyo and too close, if that makes any sense. Too far in the sense that there are so many closer, more famous places like Hakone, Kamakura and Nikko to go to, and too close in the sense that when people want to travel farther out, it's usually overlooked in favour of places like Kyoto, Okinawa, Hokkaido, etc. Mito (the capital of Ibaraki) does have two claims to fame though, and are the two reasons I finally went there (it only took me 10 years). One is that Mito is the home of kairakuen; supposedly one of the top three parks in Japan, and the other is that Mito is the natto capital of Japan. 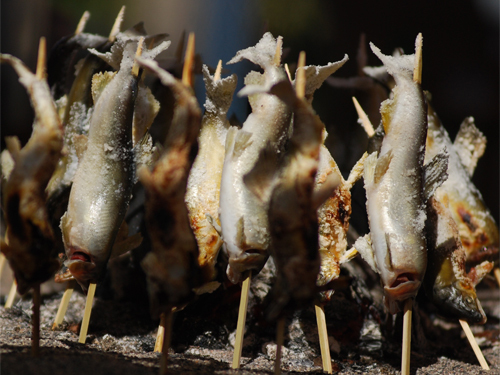 We'll be talking about kairakuen today, and natto later. 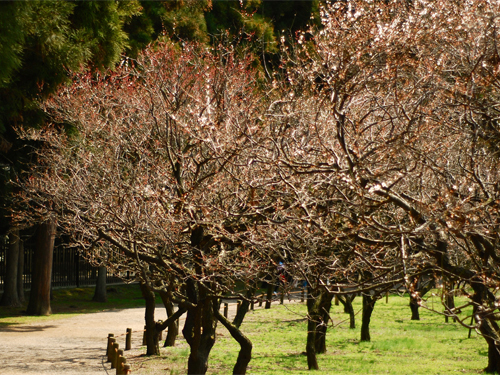 When you get to kairakuen, it's obvious after a few seconds that the main draw is the ume trees which take up a good half of the whole park. Sadly though, ume blossom season was pretty much over, most of the blossoms having already fallen. The fact that I had just missed the flowers didn't bother me so much, but what did bother me was that nobody else got the bulletin either. Although most of the ume branches were bare of flowers, and starting to grow tiny leaves, half the poplulation of Tokyo was still there milling around, presumably in search of ume. 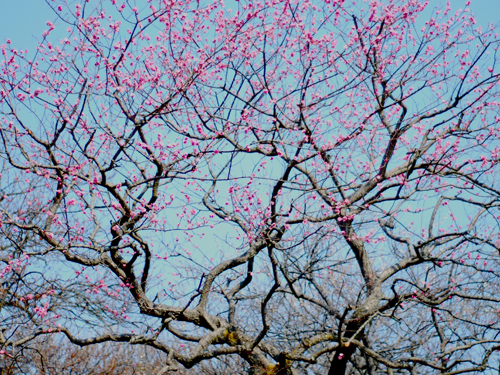 Ume trees with only a hint of pink left on them in the extreme corner of the park where only few people dared to venture. One thing you'll notice about tourist destinations in Japan is that they all have their own local speciality of fruit, fish, vegetable, etc. Another thing you'll notice is that this local speciality will almost certainly exist as an ice cream flavour. In kairakuen the flavour of the day was, you guessed it, ume (apricot). 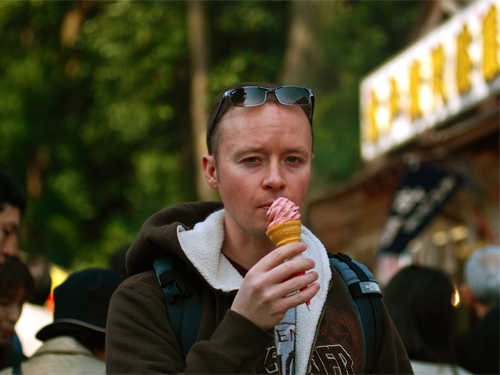 I was only slightly disapointed that there wasn't a natto flavour. Ok I lied. 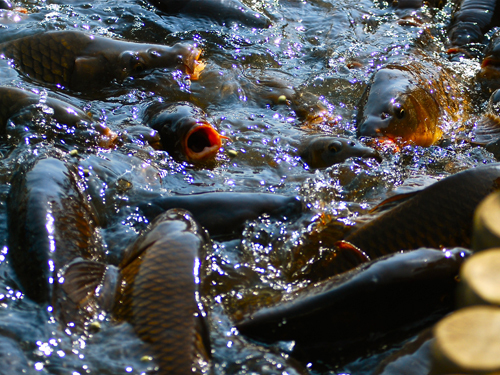 Koi (carp) are everywhere in Japan but are generally not eaten. Whether brightly coloured or dull brown, they all share large appetites for any snacks thrown in the water. Careful not to fall in, you might not be seen again. 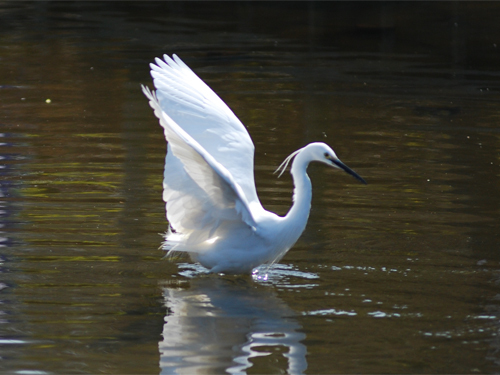 Egrets are a beautiful, but fairly common sight in Japanese parks these days. This one was jumping around and splashing his wings in the water in an effort to scare off a swan that had wandered too close. The swan, being about twice as big, didn't even deign to notice. Well kairakuen is a pretty nice park as parks go, but even without the massive crowds clogging it up, I have to question the wisdom of including it in the top three category. I have not been to the other two yet (korakuen in Okayama and kenrokuen in Kanazawa), so I'm not sure how it compares to them, but to be honest, I've been to better parks right here in Tokyo. Rikugien park near Komagome comes to mind, as does Shinjuku gyoen. Does natto end up saving the day? Find out soon!